With a lengthy injury list, there was a feeling that Dundalk were a bit vulnerable at home to Waterford, but Vinny Perth’s side responded with their finest display of the campaign. Despite missing all five of the midfielders who played in last November’s FAI Cup final, it took the champions just eight minutes to make the breakthrough, Patrick Hoban getting on the end of Sean Murray’s fine cross to head past Hugo Keto and put Dundalk in front for the first time this season. Alan Reynolds cut a frustrated figure on the sideline. The Blues boss, who felt play should have been stopped when a second ball bounced onto the field in the build up to the goal, watched his side pass up a great opportunity to draw level but Aaron Drinan couldn’t adjust his feet to meet Kevin Lynch’s inviting cutback. Dundalk punished them less than 60 seconds later. Jordan Flores, who worked tirelessly on the left side of midfield, saw his cross half-cleared and Murray found the bottom corner with a crisp finish from 18 yards. 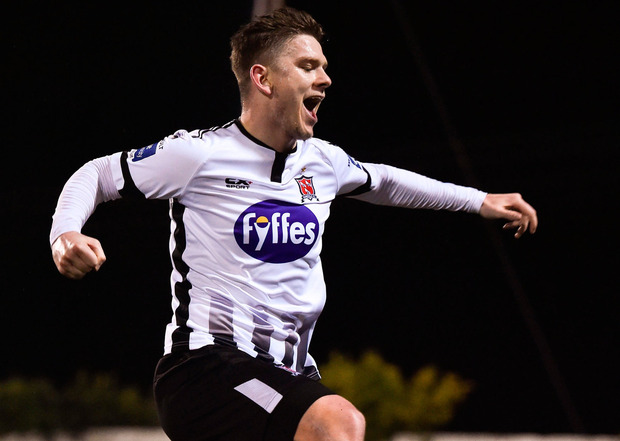 Drinan forced Gary Rogers into a fine stop early in the second half but Dundalk crafted a beautiful third in the 57th minute, Daniel Kelly giving Jamie McGrath’s sumptuous lay-off the finish it deserved to claim his first goal for the club. Things petered out after that with both managers ringing the changes. Cameron Dummigan, who joined from Oldham last month, also bagged his first for the home side in the dying stages.